Janet and I are not lost any more, well maybe a bit lost, but not as lost as before. For the past week have been watching at least 8 episodes of “LOST” every night, neglecting our home duties fit out fix. Like junkies needing a heron fix, Janet, I and yes Jon too sit in a dimly lit living room watching LOST DVD’s. You see Janet and I had caught the first 3 episodes of Lost Season 1 when it first came out on TV but after that missed a few. When we watched it again we were TOTALLY LOST as to what was going on so we stopped watching it. Season 2 is now on and we didn’t watch that because we didn’t watch season 1. Season 1 DVD’s came out but we didn’t buy them because they were $50.00 and we have better things to do with our money than buy that. So we stay at my god daughters house and her parents has the Season 1 Lost DVD’s so Janet borrows it from them and since have been filled getting un-LOST.. I fear what will happen after the last season 1 episode has been viewed… I know we are going to have major withdrawals and feel so LOST. I never got LOST. I meant the tv series. My friend finally got me the whole season 1 of LOST. K and I went thru it like crazy. Tonight we sit in front of the TV. DVD recorder ready. 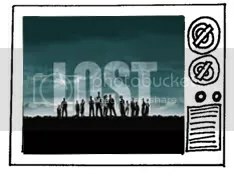 2 new episodes of lost.